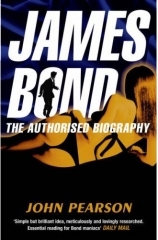 Paperback art has been released for John Pearson’s lone James Bond book, James Bond: The Authorised Biography of 007, which was originally published in 1973. Recently a hardcover was re-released in the UK, and a US version, though listed on Amazon.com, dropped completely off the radar. On May 1, 2008 the book will be re-published again in the UK this time in paperback form by Arrow Books. It would appear that a US hardcover is also back on the table this time listed on Amazon with a release of November 27, 2007 …. and a paperback that has a listing of June 24, 2008.